As a Texan, I am very familiar with the spicy fare that comes from our border buddies to the south. Last week we were lucky enough to finally try some Canadian cuisine at Maple Leaf Diner located at the southwest corner of Preston and 635. Our neighbors to the north truly know how to throw down on some grub! Maple Leaf Diner is owned by Michael Delaurier and his aunt, Chef Debra Delaurier. They both hail from Canada (duh! ), and come from a family of restauranteurs. Everything in the diner is made from scratch and have unique twists on classic Canadian faves. 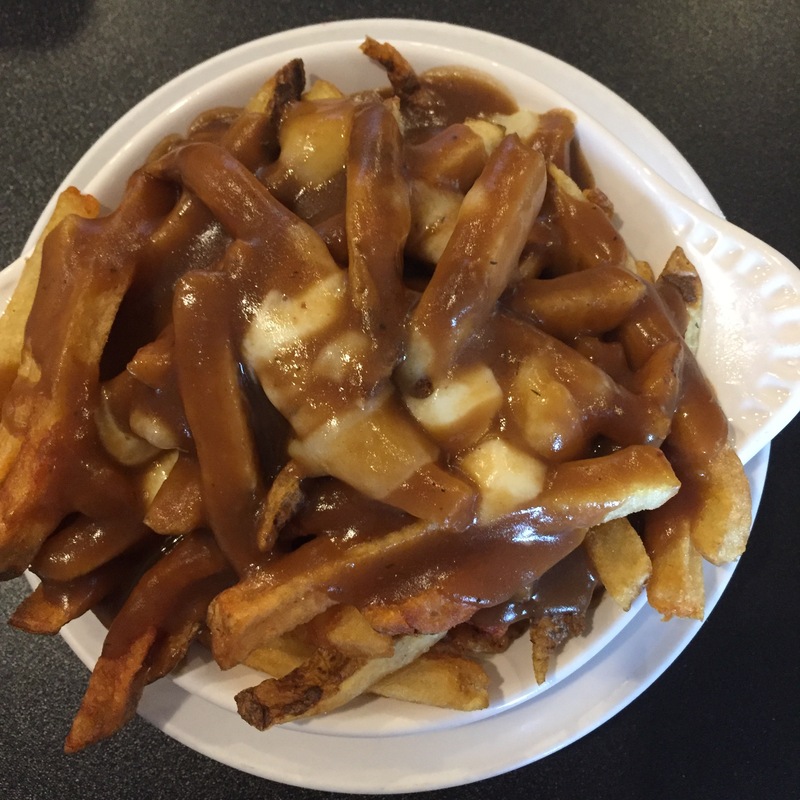 The poutine consists of hand cut fries, brown gravy, and cheese curds. The chicken and waffles rivals that of any brunch spot in Dallas. The chicken is hand breaded, the recipe passed down from his grandparents. 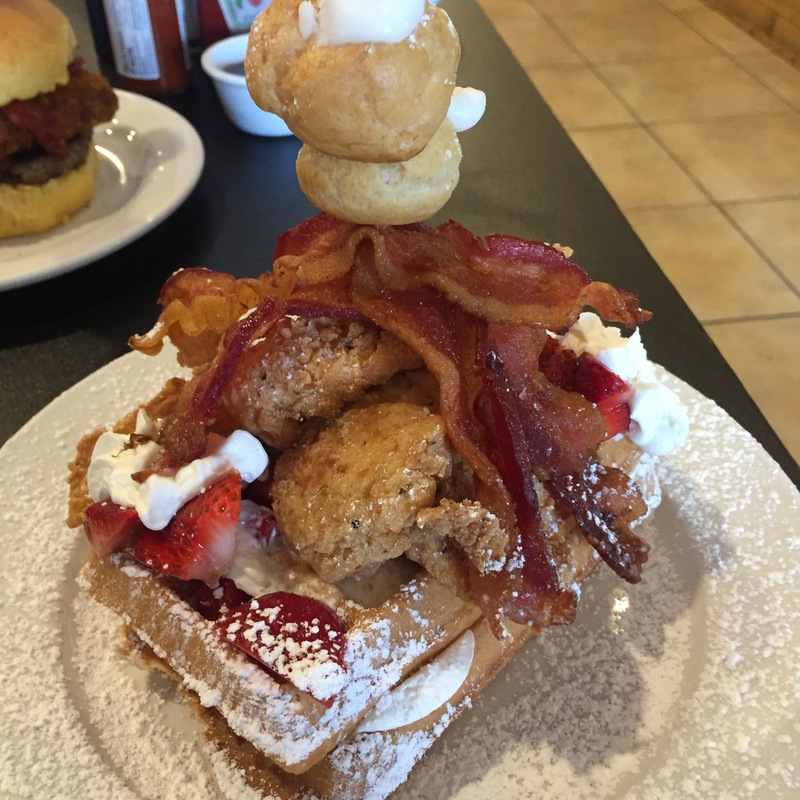 The Belgium waffle is fluffy, the whipped cream heavy, the bacon salty, and the whole thing is topped with couple of cream puffs. Don’t forget to drizzle on the real maple syrup. Now, let’s talk about the pizza burger. Why have I not seen this marriage of comfort food before? First off, the bun is baked fresh in house and holds together a juicy hamburger patty with a square of fried mozzarella cheese. Um, YEAH. Pour over Bolognese sauce, then top with sautéed pepperoni, bacon, and bell & hot peppers. The entire burger is then crowned with fried breaded mushrooms and comes with a side of zesty dill dip. 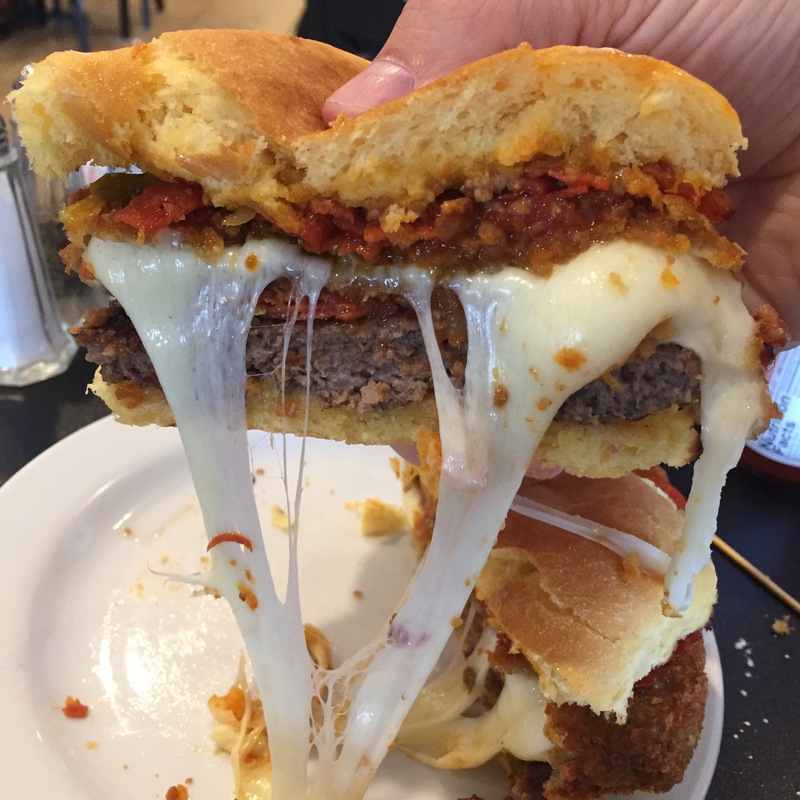 Take your knife, cut the thing in half and watch the fried mozzarella ooze down the burger. Careful, there might be kids around. The diner has a fully stocked bakery consisting of cookies, pies, tarts, and muffins. The pie I tried was the Almond Joy. I repeat, ALMOND JOY PIE. A chocolate cream pie with a layer of coconut cream. Topped with whipped cream and almonds. We also need to discuss the milkshake situation at Maple Leaf Diner. You can get traditional flavors such as chocolate, French vanilla, strawberry, and salted caramel. 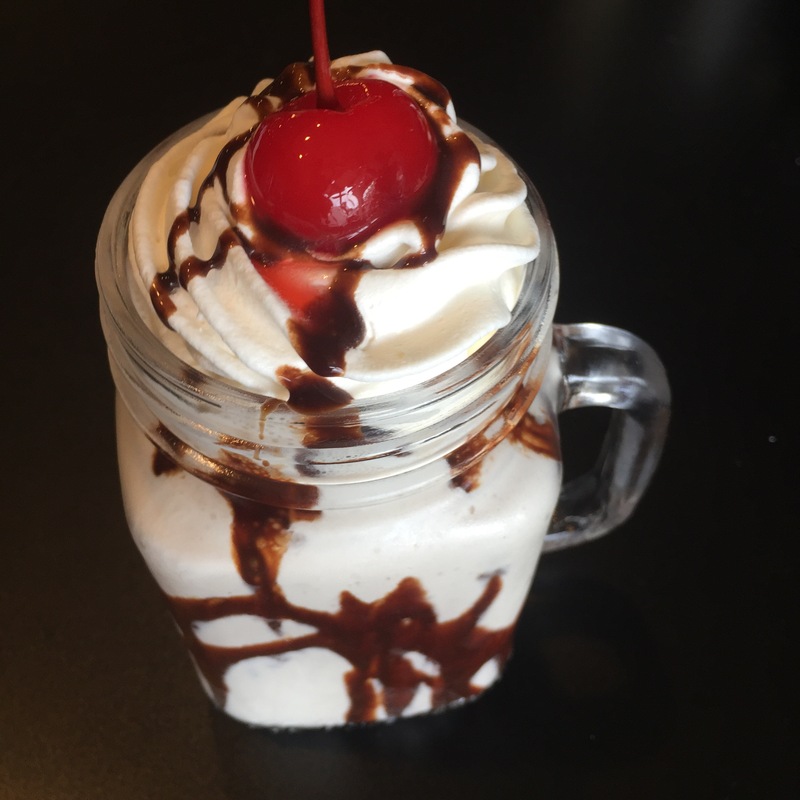 However, there is a twist, you can make your shake an “adult shake” and add a variety of spirits to your dessert. For instance, I ordered the Hummer. Basically, it is a vanilla shake, with Kahlua, Bacardi rum, chocolate swirl and whipped cream. I already get high off milkshakes, now I can get buzzed too?! The owner Michael came by and told me about The Margarita Milkshake. That will definitely be the first thing I order when I go back. I am proud to have a new found obsession with poutine. I am proud to drink a milkshake with Kahlua and rum for lunch, and I am proud to call Canada our friendly neighbor to the north. Thanks to Michael and his aunt, there is now a slice of Canada in the DF Dub. Maple Leaf Diner had me leaving the place singing O Canada! on the way home. Be sure to stop in and check it out for yourself!